Altersbild eines unbekannten Meisters aus dem Besitz von Prof. Volbach, it says on an old postcard. Professor Volbach is Fritz Volbach (1861-1940), who acquired the painting in 1903. There are not only no known contemporary references to the image but also no known solid reasons for its existence, for its having been painted during the last weeks of Bach's life. Please, therefore, let me begin by discussing the question of Bach's appearance during the last months of his life, because, as I previously have observed, if the Volbach Portrait is to be acknowledged as a genuine, authentic, and accurate portrait from life of Johann Sebastian Bach, it has to have been painted during the last months, if not the last weeks, of his life. As Christoph Wolff so cogently has demonstrated, Bach's health deteriorated quickly, and it is clear that, by the late spring of 1749, he was most unwell. 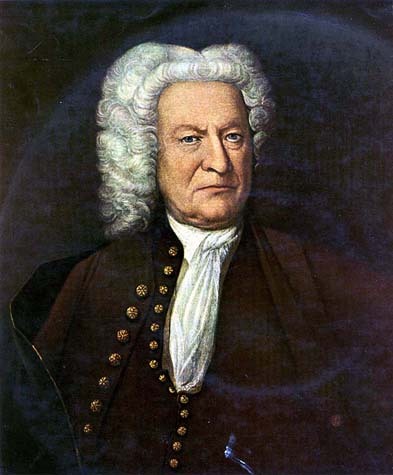 That the collapse was precipitous, like a falling house of cards, is made clear by the fact that, while Bach had been able to put on a full scale performance of the Johannespassion, BWV 245, on Good Friday, April 4, 1749, by June 2, 1749, the Saxon prime minister, Graf von Brühl, was able to write to one of the Leipzig burgomasters and, in essence, demand that the director of his private musical establishment, Gottlob Harrer, be allowed at once to audition to succeed to the posts of Thomascantor and Director musices of the City "upon the eventual...decease of Mr. Bach." 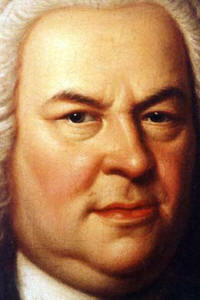 (Wolff, J.S.Bach. The Learned Musician (2000), p. 442) Bach rallied, however; on June 19, he took holy communion in the Thomaskirche, and, on August 25, at the annual Rahtswechsel service, he put on a performance of the elaborate and festive Cantata, Wir danken dir, Gott, wir danken dir, BWV 29. For this performance, he himself wrote out a new continuo part for the "Sinfonia", a part that graphically shows how much his handwriting had deteriorated. (Wolff, 2000, p. 444-445) Bach's last known signature is on a letter dated December 11; by December 27, he was no longer able even to sign his name; on the last document that he is known to have dictated, "the signature was supplied by a scribal hand." (Wolff, 2000, p. 447). 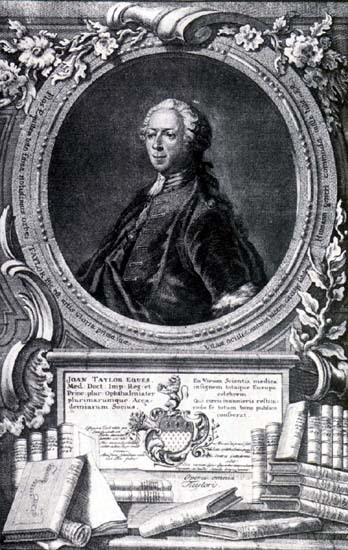 It was at the end of March, 1750, sometime between the 28th of the month and the 31st, that Bach was operated on for the first time by the esteemed English ophthalmic surgeon, Chevalier John Taylor, one of the pioneers of modern eye surgery. For our particular purposes, what is the import of this sad tale? First, the deterioration in Bach's health, and the resulting toll that it must have taken on his physical appearance, did not begin until at least six months after the latest possible date for the painting of the 1748 Haussmann portrait. Second, no one seems ever to have stopped to assess carefully the significance and the implications of Chevalier Taylor's recollection of the event, more than a decade later. First of all, that he could have confused Bach's name with that of Handel's teacher, Friedrich Wilhelm Zachow (or Zachau) is understandable; after all, Dr.Taylor was an Englishman writing many years after the fact, and the first syllable of Zachow's name rhymes with Bach. But what is even more significant is Taylor's specific statement that "the celebrated master of music" was in his 88th year. (Zachow, who was born in 1663, would have, in fact, been in his 88th year in 1750.) Had Bach's physical appearance been as it is in the 1748 Haussmann portrait, there is little likelihood that, even in retrospect, Taylor, a physician and surgeon, would have believed for a nano-second that his Leipzig patient had been 87 going on 88. If, however, the man upon whose eyes Taylor operated looked like the man in the Volbach Portrait, such an error could easily be made. Now, a comparison, anatomical detail by anatomical detail of the face in the Volbach Portrait with the face in the 1748 Haussmann Portrait, focussing on the physiognomical characteristics that an accurate and authentic depiction of the face of Johann Sebastian Bach must have. As I did in demonstrating that the Weydenhammer Portrait Fragment is an authentic and accurate depiction of the face of Johann Sebastian Bach, I shall begin at the top, and work downwards. Once again, I shall use the 1748 Haussmann Portrait as the absolute standard, but, yet again, I shall also include the equivalent details from the 1746 Haussmann Portrait as a reminder that that painting, sadly, is not reliable for comparison purposes. The details from the 1748 Haussmann portrait are on top, or to the left, as the case may be, the details from the Volbach Portrait are in the center, and the details from the 1746 Haussmann Portrait are on the bottom Finally, unless otherwise indicated, left and right are from Bach's perspective. But, before I focus on the face, please let me point out that the similarity of the basic pose in these two "brustbilder" allows one to compare the slope of Bach's shoulders. He slouched, so to speak, as some might expect of a keyboard player, and the distance from his neck to the juncture of shoulder and upper arm (I hope the doctors and scientists who are reading this will forgive the artless inexactness of my descriptive language!) seems to be greater, and the angle of the slope thus less acute, on his left side than it does on his right. Significantly, this subtle anomaly, which is apparent in both the 1746 and the 1748 Haussmann Portraits, is also apparent in the Volbach Portrait. The sharper angle of the junction of the right sleeve with the body of the coat in the Volbach Portrait also reinforces my contention that the Bach of the Volbach Portrait weighed significantly less than the Bach of the Haussmann Portraits. And now the direct comparison of the faces. I do not have any trouble at all concluding that the face in the center is the face on the left and on the right, affected by serious, ravaging, and enduring illness. The asymmetry, the distinctive arch, and the upward creases are the same, but there has been significant hair loss. 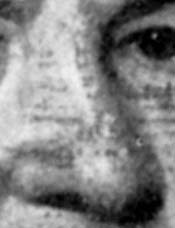 One can still make out the arches of the brow, but there is much less hair, a logical effect of stressful illness. Once again, the similarities are astonishing. 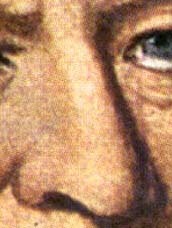 Because of the graininess of the photograph of the Volbach Portrait it is difficult to clearly analyze the right-hand portion of the drooping eyelid over the right eye, but the distinctive fold that the drooping eyelid takes as it meets the bridge of the nose is not only in the same location but also more pronounced in the Volbach Portrait, which would make sense if it had been painted at least a year and a half after the 1748 Haussmann portrait. The drooping eyelid over the left eye lags behind that of the right, as it does in the 1748 Haussmann portrait. Also, the distinctive curve of the portion of the lower right lid nearest to the bridge of the nose appears to be the same. Until I have seen and studied at least the new 8x10 transparency, if not the original of the Volbach Portrait itself again, however, I shall offer no firm comment on the color of the eyes, but I will make the observation that the color is blue-grey in the reproduction used for this initial comparison. Also, the bags beneath them appear to be the same. I continue, however, to be struck by the peculiar rendering of the left eye; the watery, cloudy nature of the base of the pupil supports, I think, my personal belief that the Volbach Portrait was painted after the eye operations. Yet again, the similarities are astonishing. 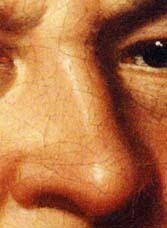 Again, the graininess of the photo of the Volbach Portrait is something of an impediment, but the essential shape of the nose is identical, and the little ridge on the lefthand side of the bridge of the nose about a third of the way down can be made out. And, sadly, the nose of the 1746 Haussmann Portrait is one of the areas in which the damage has made it unreliable for comparison purposes. And, now the mouth and jaw. 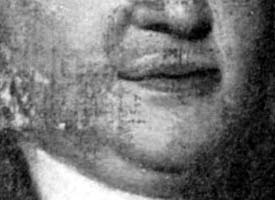 As I have shown elsewhere, in an analysis of the essential elements of Bach's facial physiognomy, an underbite, a protuberant lower jaw, and the absence of teeth are essential. Once again, the essential elements appear to be present. 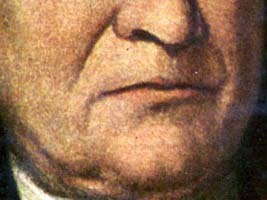 The lower jaw appears to protrude beyond the upper one, and the upper lip is sunken on the left hand side in the same spot that it appears to be in the 1748 Haussmann portrait. The shape of the right hand side of the lip is clearly different, however, and the distinctive creases are longer. These differences in detail are telling. First, it might be indicative of the loss of additional teeth between 1748 and the spring of 1750. Secondly, Chevalier Taylor makes a specific reference to a paralytic disorder. Is it possible that the beginnings of the deterioration of Bach's health are attributable to a stroke and that he suffered at least one, and perhaps tw0 more, before his death? It certainly would comport neatly with the kind of essential physical problems that Christoph Wolff suggests were the root cause of Bach's last illness. 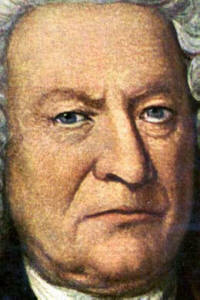 A mild stroke would also neatly explain (1) why Graf von Brühl moved with all deliberate speed to railroad the Leipzig Town Council into audtioning Bach's eventual successor, Gottlob Harrer, (2) Bach's recovery in the summer of 1749 and (3) the initial problems with his handwriting, particularly if the stroke was on the right hand side, and I know of no evidence to suggest that Bach was left-handed. As Christoph Wolff has demonstrated, Bach was not able even to sign his own name after December 27, 1749, an indication of yet another stroke. 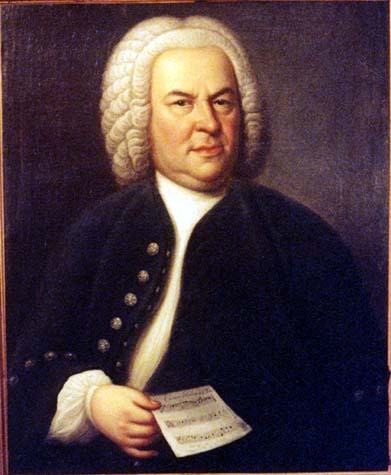 Of course, the effects of the strokes provides a cogent and logical explanation of the "problem" of the dimple or cleft in the chin that Bach seems to have in the Volbach Portrait. 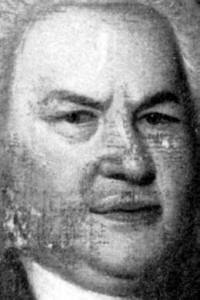 I have examined the issue in some detail in The Queens College Lecture of March 21, 2001, The Face Of Bach - The Search for the Portrait that Belonged to Kittel, so, for the purposes of this analysis, suffice it to say, that the Bach of the 1746 and 1748 Haussmann portraits was corpulent, to phrase it politely, and certainly a minimum of 25 to 30 pounds heavier than the Bach of the Weydenhammer Portrait Fragment or the Bach of the Volbach Portrait. 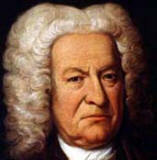 The loss of weight that was an inevitable by-product of the rigors of Bach's precipitous physical decline and the associated health problems, including at least one, and possibly as many as three strokes, before the stroke that ultimately caused his death on July 28, 1750, surely would have "uncovered" the cleft that the the subcutaneous fat obscures in both the 1746 and 1748 Haussmann portraits. As far as I am concerned, the Volbach Portrait passes the physiognomical comparison test convincingly, but is there anything else about this extraordinary image that might independently support the conclusion that it is a portrait from life of Johann Sebastian Bach painted in the last months of his life? As it happens, there is. First, let's look at the the Volbach Portrait together with both the 1746 and 1748 Haussmann portraits again. One cannot help but be struck by the fact that, with one telling exception, the pose in the Volbach Portrait is for all practical purposes the same as that of the the 1746 and 1748 Haussmann portraits. That significant exception, of course, is the Volbach Bach is not proffering a copy of the Canon triplex à 6 vocibus to the viewer. Instead, almost symbolically if one believes, as I do, that Bach was partially disabled, if not paralyzed, on the right side during the last months of his life, his right arm is shrouded by the cape that has been draped around his shoulders. How else could Sebastian Bach send a message to the knowledgeable spectator that this portrait does, in fact, depict the same man as the 1746 and 1748 Haussmann portraits? Anyone who has spent any time studying Johann Sebastian Bach is well aware of his obsession with numbers, numerology, and numerological equivalents, and also knows that the Bach number is 14. (B=2 + A=1 + C=3 + H=8 = BACH=14) I cannot believe that in 35 years I never had bothered to count the buttons, but until the morning on which I relented and, ready or not, wrote this essay, I never had. There are seven buttons on the coat, and 14 on the waistcoat. That one set of buttons is the Bach number, and the other is half that number cannot be coincidental, and it suggests compellingly that, in fact, whether he could see it or not, Bach did have "input" into the form and substance of the portrait. The presence of the 14 buttons on the waistcoat reflects the reality, first noticed by the great Bach scholar Friedrich Smend a half a century ago, that the total number of buttons on the jacket and vest of the 1746 Haussmann Portrait is 14. (Why there are a total of 17 buttons either wholly or partially visible on the garments of the 1748 Haussmann Portrait is an anomaly that has yet to be explained.) And, the total number of button holes visible on the garments of the Berlin Portrait is also 14. And now, what about the issue of why? Why and for whom was the Volbach Portrait painted? 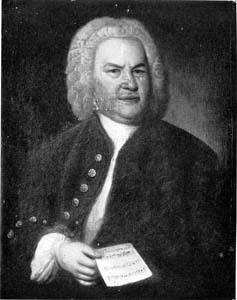 The answers to that question remain to be ascertained, but, in light of the fact that it appears that we are, in fact, dealing with a genuine portrait from life of Johann Sebastian Bach, painted in the last weeks of his life, research into issues that only a few days ago seemed of little significance now becomes both important and imperative. First, for whom was it painted, and why? I believe that I have figured that out, and that, ironically, the answers have been in front of us all the time. I have not had the opportunity to test the hypothesis thoroughly, however, and I shall not advance it until I have tested and refined my explanation thoroughly. Suffice it to say, however, that it would come as no surprise to me if my hunch that Elias Gottlob Haussmann was the as yet unidentified artist who painted the Volbach Portrait turns out to be accurate. But, one thing is now certain. Like it or not, those of us who are fascinated by the Bach iconography now must come to grips with the inscrutable Volbach Portrait. So far, the arguments in favor of its being both genuine and an accurate depiction of the face of Johann Sebastian Bach far outweigh the arguments against. No longer can the Bach scholarly community turn its back on the Volbach Portrait, a shattering image, an image that shows Johann Sebastian Bach as he prepared to cross from this world to the next. Wenn wir in höchsten Nöten sein. Vor deinen Thron tret ich hiermit.